Recommended to: Readers who enjoy Fantasy reads with brave, young protagonists. 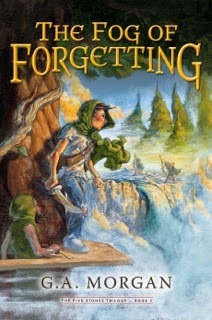 In The Fog of Forgetting, the beginning of a new adventure-fantasy trilogy, five children wash up on the shores of an foreign land, unwitting agents of destiny in a realm struggling to withstand a force that could change their world -- and ours -- forever. Move over, Narnia. The journey to Ayda has begun. Sneaking out for a quick boat ride on a summer day, five children find themselves engulfed in a curtain of dense, powerful fog that transports them from the rocky Maine coast to the mysterious island of Ayda. Rescued by Seaborne, a machete-toting wayfarer of few words, the children suddenly find themselves at the center of a centuries-old battle between Dankar, the ruler of Exor, and three siblings that rule the other realms of Ayda. At stake are the four stones of power and the elusive Fifth Stone that binds them all. When 9-year-old Frankie is kidnapped by Dankar, her older sister Evelyn and the three Thompson brothers must learn to harness the powers of the daylights, ancient forces of earth, fire, water, and air, to navigate their way through the realms of Ayda, rescue her, and find a way home. G.A. Morgan is a powerful new voice in the young adult adventure-fantasy genre, telling a story full of myth and mystery, action and peril. In Ayda, she has created a land rich with history and steeped in lore, one that exists not just in imagination but unnervingly, realistically, parallel to ours. A note to authors out there: If you ever want me to read your Fantasy book, compare it to The Chronicles of Narnia. Seriously. When I saw that G.A. Morgan's new book was billed as "the next Narnia", I had to read it! Those books fueled my childhood imagination, and I've re-read them many times since then. I was excited to see where The Fog of Forgetting would fall for me in comparison, and anxious to be introduced to a new world. That being said, there were plenty of things about this debut novel that I really did like. Starting with the setting. I can think of no better place to hide a new Fantasy world than off the banks of a summer lakehouse. I loved the fact that the characters had such an attachment to this seasonal destination. That there were memories, both good and bad, wrapped up in this place made it feel that much more real. It was a place of magic, and I completely believed that a new world could be hiding just beyond the horizon. I also liked the characters, although they took me a while to warm up to. Chase, Knox and Teddy were a little much to handle at first. Well, in all fairness, they are three young boys. I suppose they'd be a lot to handle in real life! However it took me a while to see past their childishness. It wasn't until they actually arrived in the land of Ayda that I started to enjoy following them. Each boy soon came into his own, and they did grow a lot during their adventures. I have to admit that I still never really felt connected to them entirely though. I just never felt like I knew them well enough to be invested in their journey. In terms of the world-building, Ayda wasn't quite what I expected. I loved the idea of a world surrounded by fog. Of a place where magic is commonplace. I was never able to actually place myself there, unfortunately. The concept of calling the magic that flowed through people "daylights" bothered me, especially since it was never explained. The other main problem was that most of the actual world descriptions are done through info-dumps. Even though they were masked as stories told by characters to our protagonists, they lost their magic. I never felt like I was in Ayda. Only that I was reading about it. Still, I did enjoy the good majority of this read. The ending left me wanting a bit, but I'd be willing to continue on to see what happens next. This bookworm gives The Fog of Forgetting three stars. It wasn't quite Narnia, but I see potential in G.A. Morgan's new world.